Wireless transmission is getting more and more popular. I will try to show you how does it work using coupled receiver and transmitter which are both working on the same frequency (433MHz). The 433MHz frequency is the carrier frequency. This means it is a frequency which is used to transport the data. For example when using amplitude modulation (AM) the amplitude of signal is changing. Knowing this you can determine if 0 or 1 is being send. Those two modules use FSK (frequency shift keying) frequency modulation to encode the data into the carrier frequency. To send logical ‘1’ it uses a frequency slightly higher then the carrier frequency. While sending logical ‘0’ the frequency transmitted is slightly lower than the carrier frequency. A simple device was assembled. We can distinguish two sides: the side of the transmitter and the side of the receiver. 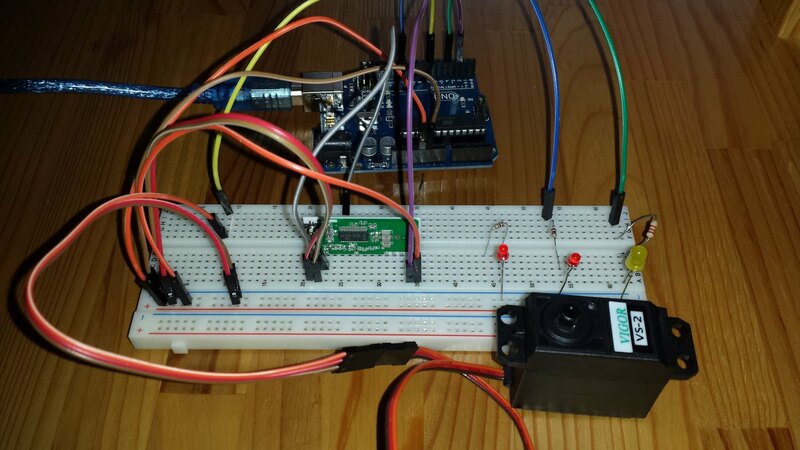 Both parts are equipped witch Arduino. The task is simple. The transmitter reads analog value of a joystick which is connected to one of ADC channels, after that the read value is send using the transmitter module. 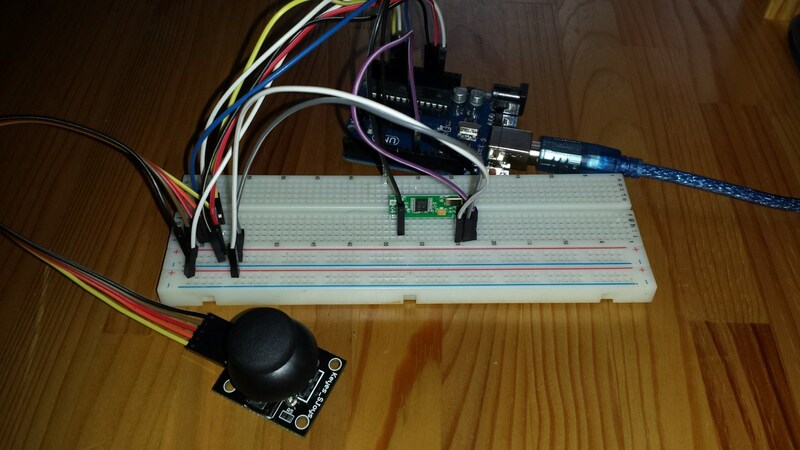 On the other side the receiver gets the data and displays it using a LED. 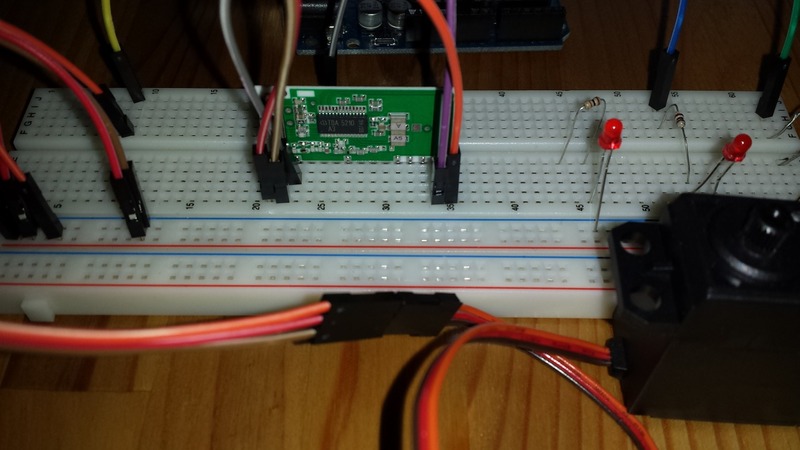 The read data is used to change the brightness of the LED by changing the duty of a PWM signal. Also a RC servo is connected that moves accordingly to the joystick’s movements. A library was used in this project which delivers the interface for communication with the radio modules. You can of course switch the patterns (this is done in RCSwitch Arduino library). During communication you may experience some data lost. It is due to the interferences. One way of dealing with such phenomenon is to change the duration of the low and high state while transmitting data. Another way is to change patterns. All of this does not come without cost. You pay for robustness with a longer transmission time. All of those mentioned techniques are implemented in an Arduino library RCSwitch. SimpleTimer – enables event based programming. You can create routines and add them to the simple scheduler which handles the execution of those routines. Something similar to what was described in A small operating system. Below you can see a snippet of the code.